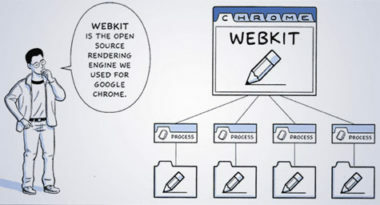 The New York Times reports that Google launched its largest offline advertising campaign in company history with the debut of a series of 90-second television ads promoting its Web browser, Chrome. The search giant is heavily promoting Chrome with the belief that people who use its browser will be more likely to continue using Google search. Chrome currently has only 18 percent market share, compared with 45 percent for Microsoft’s Internet Explorer, according to StatCounter, a Web analytics firm. However, Chrome’s share has climbed 10 percent in the last year and the number of Chrome users has tripled to 120 million. The company is so focused on marketing Chrome because the more people use it to browse the Web, the more they will use Google for search, as well. “The browser’s probably the most important piece of software on anyone’s computer, but a lot of people, the people we’re targeting with these TV spots, don’t know what a browser is,” said Robert Wong, creative director of the Google Creative Lab. Google’s new ads have an emotional angle and use real-life stories to show what users can do with Chrome. The campaign appeals to Internet users who care more about the personal benefits than the technical ones. Ads show families making scrapbooks in Gmail, as well as an international love story, and the use of Chrome’s tool bar and YouTube to create videos to help gay teens who fear bullying. While the new TV campaign highlights the personal stories and makes subtle references to Chrome, the accompanying online ads are more direct and boldly tell viewers to make the switch and download Chrome. Check out the Google Chrome Channel on YouTube to see the television commericals.